A complete ready to install kit that provides 3 to 4 hours of bright light everyday, whenever & wherever you want it. A typical stand alone home lighting system comprises of Solar PV module for charging battery, Deep cycle tubular plate battery for storage, Charge controller for charging & discharging of battery & Lighting luminary with built in high efficiency inverter. A portable, Complete, ready-to-use light. 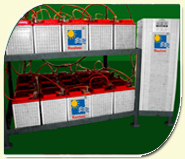 It is housed in a plastic body and has a in built 12V 7 Ah (Ampere hour) sealed maintenance free (SMF) lead acid battery, which is charged by Solar module. 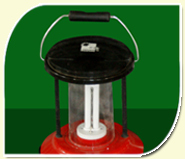 The lantern is fitted with a four pin 7 watt compact fluorescent lamp. The CFL provides light output (52 lumens per watt) equivalent to that of a 40 watt (9 lumens per watt ) bulb. 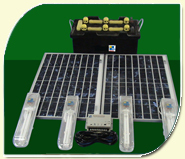 The solar lantern has a built in detachable electronic circuit having inverter & charge controller. High efficient two step charge controller protects battery from deep discharge & over charging. Solar Street Lighting System is an ideal lighting system for Roads, Yards, Residential Colonies , Townships, Corporate Offices, Hospitals, Educational Institutions & Rural Electrification. 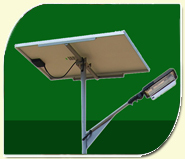 A typical stand alone Street Lighting System comprises of Solar PV module for charging battery, Deep cycle tubular plate battery for storage, Suitable electronics for the operation of the lamp & safe charging & discharging of battery. Both the charge controller & inverter is fitted inside the luminary, to avoid tampering & to ensure trouble free operation. Solar Power pack is an ideal lighting system for house hold electrification, Corridor lighting, Campus lighting & Garden lighting. Centralised power plant for street lighting, Garden lighting, corridor lighting & Emergency lighting application can be designed to suit specific customer requirements. Size of the power plant depends on the connected load. Rashmi specialises in manufacturing Solar flat plate collector (FPC) with its in house facility for Ultrasonic welding & Selective coating. 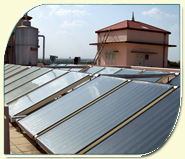 Rashmi offers the widest range of domestic solar water heating systems with FPC up to 1000 LPD, in multiples of 100 Liters per day & 125 Liters per day. Rashmi also offers systems with heat exchanger for hard water with hardness above 150 ppm and also pressurized systems to operate at 3 kg/sq .cm. cold water supply. Rashmi offers industrial systems of any capacity designed to meet customer’s specific requirements, in thermosyphon and forced circulation configurations up to 85oC.The technical team at Rashmi specializes in requirements study, Project proposals, Design of Pressurized systems, Integration with hydro-pneumatic systems, In-process heating, Space heating, Heat exchanger based systems for hard water and several other areas relevant to energy conscious industries. We at Rashmi Design, manufacture, supply, install, commission and provide after sales services, on turn key basis, for the complete range Solar photo-voltaic systems suitable for domestic as well as industrial applications. Rashmi has state of the art manufacturing facility to produce high quality PV modules. 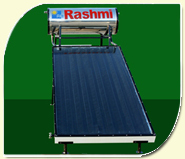 Rashmi offers widest range of PV modules from 5 Wp to 270 Wp. 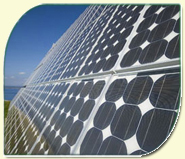 Rashmi is an MNRE approved PV module manufacturer. Our modules are tested and certified IEC 61215, IEC 61730. All the raw material used are as per international standards & the module performance confirms to IEC standards. Rashmi introduces the state of the art small wind turbines that are highly refined and engineered for reliability & performance, highest build quality in its class. 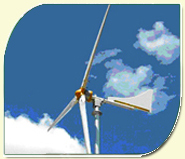 Rashmi offers these wind turbines in four models, the rated output ranging from 650W to 4200W.